Les Lataniers has a uniquely Caribbean charm, and I love how the owners have combined antique decor with modern amenities. The lava stone infinity pool is awesome, and the cabana is the perfect place to relax and freshen up after a day in the sun. The gym is really well-equipped, and the massage room is a nice touch. Panoramic views of the sea! Les Lataniers sits above Anse des Cayes and has panoramic sea views. 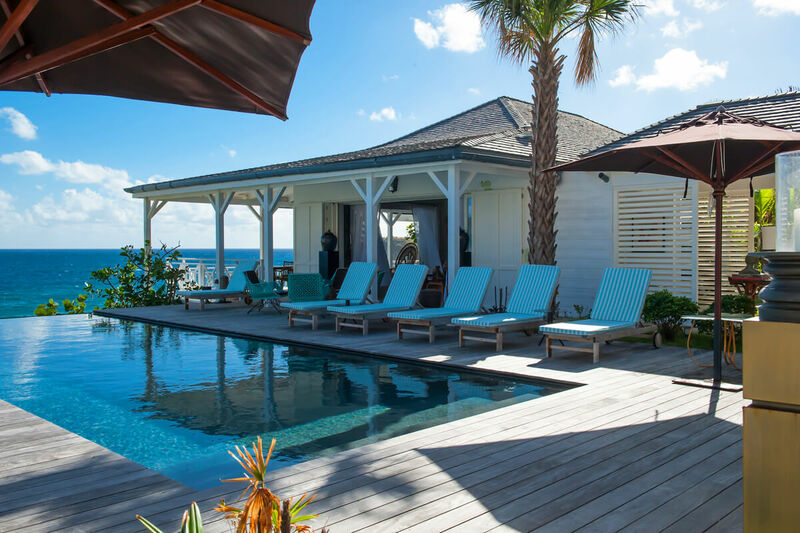 This property has everything a family could want for an action-packed vacation, including a spa, gym, fully equipped kitchen, and proximity to Gustavia. Outside, the lava stone, infinity pool is heated and surrounded by sun beds. After taking a swim, guests can relax in the pool cabana’s half bath and vanity or head downstairs to the fitness center. Workout with the gym’s resistance equipment, cardio machines, and weights or enjoy a massage in the spa. Antique furnishings are balanced with marble and precious woods to create a classically elegant interior. The living area opens to the terrace on two sides and stays cool with air-conditioning and ceiling fans. Its entertainment system includes HDTV, Dish network, a DVD player and collection, a sound system, and a docking station. There’s a half bath off to the side as well. A covered passageway leads into the dining room and kitchen. The dining room can fully open on two sides, and the well-equipped kitchen is complete with a wood-fired pizza oven, professional range appliances, an espresso machine, a juicer, a blender, and a raw fish station. From the living room, a staircase leads down to the Tiffani and Hemingway suites. Each of these suites have two twin beds that can be made up as a king, and Hemingway’s also has a sofa bed. From Hemingway’s, guests can access a staff room suitable for a nanny. On the same level, but with separate outdoor access, are the Safari and Voyager suites. These suites both have king beds. The Master suite is in the main house, right off the living room. It has a king bed and a private terrace with a Jacuzzi. The Architect’s room is situated next to the pool cabana in its own cottage, and it has an outdoor bathtub and a king bed. All six suites have air-conditioning, HDTV, a sound system, a walk-in closet, and exterior access. Each bedroom has an ensuite bathroom with a bathtub, a rain head shower, and a dual vanity. The windows throughout the interior are all screened. This oceanfront villa is a short drive from Gustavia and several beaches. It’s ideal location combines peacefulness and convenience, although there’s hardly any need to ever leave the villa. A housekeeper visits daily, except on Sundays and holidays. Bedroom 1 - Master: Main Level - Private stone pool on balcony. Nanny Room : This bedroom is accessed using Hemingways Room only. Additional fees apply for use of this room. Ask villa specialist for more details. Upon arrival guests will be met at the airport my a member of the villa management team. After securing the rental vehicle guests will follow them to the villa for an orientation of the property.